This year we will be your last year at Cottage Lane. It is an important time in your life as you transition to middle school. It is important to reflect on who you are and what you believe. This way you can always stay true to yourself. NPR used to air a series called “This I Believe.” This I Believe was based on a 1950s radio program of the same name. Each day, Americans gathered by their radios to hear stories from the likes of Eleanor Roosevelt, Jackie Robinson, Helen Keller, and Harry Truman as well as corporate leaders, cab drivers, scientists, and secretaries—anyone willing to share their guiding principles by which they lived. These words brought comfort and inspiration to a country worried about the Cold War, McCarthyism, and racial division. Listen to “30 Things I Believe.” In this particular episode, a first grader, Tarak McLain, reflects on his Kindergarten 100th Day Project. While most students bring collections of 100 objects, Tarak brought in 100 things he believes. For the podcast, Tarak shares 30 of those beliefs. Listen to his believes. Do you agree/disagree with some? Select two that surprised you. How old is Tarak now? Do you wonder if he still agrees with his 7-year-old self? 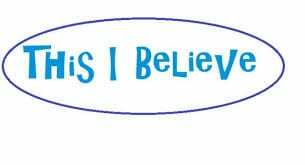 Use google slides for your “I BELIEVE” presentation.